A BILL BANNING THE SHARK FIN TRADE IN THE UNITED STATES appears likely to be passed by Congress, based on a hearing earlier this month by a House subcommittee. BIPARTISAN SUPPORT With 200 co-sponsors, HR1456, the “Shark Fin Trade Elimination Act,” has strong bipartisan support in the House and a similar bill under consideration in the Senate has 19 co-sponsors. The hearing by a subgroup of the House Committee on Oversight and Government Reform was described in “Congressional Crackdown on the Sharkfin Trade,” an article in the Hawaiian news site Honolulu Civil Beat. 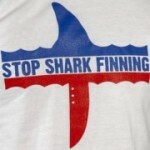 Hawaii became the first state to ban the sale of shark fins in 2010. A “DELICACY,” A CRUEL TRADE Dried for use in shark fin soup, considered an Asian delicacy, fins are the most valuable part of a shark. Laws banning finning – in which captured sharks have their fins slashed off and then are thrown back into the sea alive to experience a slow, painful death – have been in effect for some years but profits have been so lucrative that the trade has continued. A pound of shark fins can fetch hundreds of dollars and a bowl of shark fin soup as much as $100. MAKING SELLING AND USING ILLEGAL The bill would create fines of as much as $100,000 for participants in the shark fin trade. The U.S. has previously enacted laws prohibiting shark finning in U.S. waters, but loopholes and inconsistent state laws have made enforcement difficult. Supporters hope banning the selling of shark fins as well will prove more effective by reaching downstream parts of the trade.